Few days ago I pushed an update to the Utopian Bot to try and mitigate the increasing Voting Power used by the bot every time it votes. However, due to the ever increasing number of contributions, the few hours of Voting Power were far from enough. What I will propose here will hurt, especially today with nearly 300 contributions waiting for an upvote, and more than 5 hours to wait still. However, if we let the bot go below the range, it means a longer sleep, which means more contributions and an even longer sleep the following time etc. So what I am proposing in this Pull Request is simple: after attributing all the votes, we check the total vote that will be spent and compare it to what should be spent. To stay in range (80-100%), the bot can only vote the equivalent of 10 times at full power (10*100=1000%). I guess you can see the issue, yesterday the bot went down to 70%, if we let it lose it will go down to 60 today with the bot voting nearly twice what it should. To avoid getting this out of hand, we need to divide the contribution upvotes by the calculated ratio. Yes it means dividing all contributions rewards by two today. I know none of you wants to read that, but if you don't want the Voting Power to drain progressively until the bot vote onces a week, there is no way around it. As you can see, at the end, exactly 1000% have been used. Get more delegation : We cannot maintain the current state of payout if the number of contributions is exploding while the Steem Power of @utopian-io stays the same. So in case I'm catching some whales, please go and delegate to Utopian.io, you ll be acting for the greater good while making a good return on investment. Get rid of the minimum and stick to the pool configuration, but it means that highly competitive categories will get very low rewards. I hope you will all see the necessity of this before throwing rocks at me , I also have my posts in there and wish there was a better solution. You've got a 1UP from the @utopian-1up curation trail. 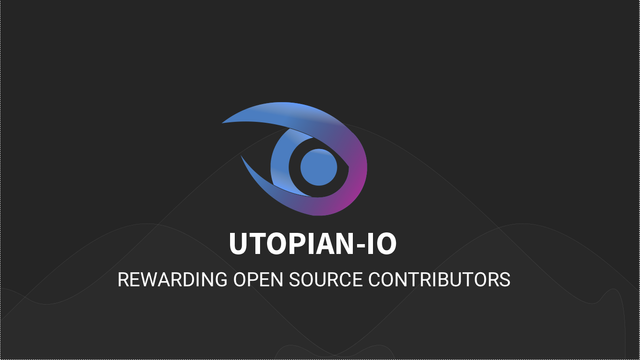 24 Utopians have upvoted your quality contribution to the open source community. Join 1UP for better posts and high curation rewards. 1UP is neither organized nor endorsed by Utopian.io! We really do need to put in manual voting for topics. I saw this in the bi-weekly and I'm okay with moderators or 'specialists' voting for certain categories of their expertise for the value each contribution is worth. I'm okay if the bot sleeps longer. That means more time for the moderators or reviewers to properly evaluate the contributions for their value. I think we've been accustomed for the bot voting our posts in the next 24 hours, which is great. But this is the consequence of having this much contributions. Again thank you for your hard work and one thing I'm suggesting (an am planning to make sub-project or suggestion contribution about) is to have multiple utopian bot accounts. One account for each category and then spreading the delegated Steem Power to those bots. This is similar to what @randowhale did. So instead of just one @utopian-io bot, there will be multiple @utopian-io bots (e.g., @utopian-io-bughunter, @utopian-io-tutorials, etc.). This is one way I believe we can scale. Multiple bot could be indeed a solution, and manual voting are much needed as well. Having the bot sleeping longer is not feasible because it will increase the number of contributions to be voted, and the time it sleeps will increase at each iteration. Thanks @stoodkev for considering the suggestion. Looking forward to the developments. With this will be the need for different maintainers for the bots? Thank you. I've been looking for a way to contribute to the bot didn't know how. I've uploaded my proposal here as a sub-project. I agree, this is getting slowly out of hand if we don't change the mechanic. I think it is better to go with your suggestion than waiting forever for the upvote until the post eventually gets out of range after seven days. If we want to keep it a fair and equal system that doesn't care about the open source project at all (which certainly is discussable) then we need indeed more SP to cover the masses. On the other hand we could also try to manually improve the system. My 1UP project is a step in that direction but works outside of the @utopian-io bot. But maybe something like that would be a way in the right direction. contributors also,,, its a win win ish.